The four of us - April, Karen, Peggy, and myself arrived in Charlotte around 4:30pm (EST) yesterday. Apparently we just missed a wee bit of security excitement. Depending on who you speak to, rumor has it a man ran through the security check with a weapon OR there was a bomb threat. We saw no evidence of anything amiss when we disembarked the plane. We checked in to the most fabulous Embassy Suites and freshened up. Then we joined a group of other early arrivers for dinner. Today, I have seen five women that I met last night - what a relief to know a few people in this crowd! This morning came early (6:00 here is 4:00 at home), and we got all gussied up in our business casual gear. We got ourselves registered for the pre-conference and launched into session. Renee Swope spoke for the early morning devotional. It was G-O-O-D! After the session, I asked her about her toes and fingernails (based on her comment in this post). Right now I am skipping out on a session and hiding in my hotel room. The jitters were taking over, and I needed to step away and crank out my voice in praises to my Lord. Casting Crowns and I are currently rockin' out "The Voice of Truth." But wait - the reason for my title. One of the sessions this morning hit me smack in-between the eyes. Powerful, world-changing, ministry-shaping words of wisdom were imparted. And not only did I write down every single word, I got to speak to the one who shared the words. First, I made sure to tell her how she blesses me and how her words impacted me. Then, I pulled out the camera and handed it to Peggy. From one blogger to another, she totally understood my need to record the moment. Today is going to be a really good day! Today is going to be a GOD day! It's complete with The Proclaimers' funny accents and everything. If that song is now hopelessly stuck in your head, or if (gasp) you've never had the privilege, just click here. Though you'll be reading this in the morning, I'm typing it late at night. I'm like a school girl, the night before the first day of Kindergarten. I am so excited that I'm practically vibrating. Yet I feel just nervous enough that my tummy is gurgling. As you read this, I am in the skies above - well, I just don't know where. It has occurred to me that I don't actually know where North Carolina is in relation to Alberta! I always did dislike geography (although we actually call it social studies here in Canada). As She Speaks flows along, I will try to pop over to my hotel room to post random pictures and little details about the happenings. And you can trust that if when God smacks me in the face with something He wants me to learn, I will tell you all about that, too! Just fyi, my publisher appointments are at 2:45pm and 7:30pm on Friday. And my speaker evaluation groups at 8:00pm on Friday and 5:00pm on Saturday. This is in NC time (no clue what time zone that is, lol). So if you feel compelled to pray that I don't barf on my shoes - or those of the lovely publishers I will be speaking to - please do so especially at those times. If I get to meet Lysa in person, oh golly, I will probably trip over my own tongue! Something just occurred to me - today is Wednesday! And I said I would choose a winner on Tuesday afternoon. Oops! I have been a bit distracted. HaHa I could've wrote your post. I'm a Mom of 5 (+2 nephews) and I deplore laundry (cuz there is so much of it) and cooking is okay, if I must do it! Looking forward to your updates, and I grabbed your link from the BlogHop ‘09! Nice to meet ya! We decided to purchase a good quality set of bunk beds for the two girls closest in age (14 months apart) to share. The beds are farther apart than your typical bunk beds (so kids aren't constantly bonking heads), and they can be separated into two twin beds. I'd love to show you a picture here, but I am seriously too lazy to go take one, upload it, download it, then spend four hours re-formatting this post. For years Abbey (7) and Megan (6) have shared a room. Currently, because our downstairs has been off-limits, Shea (4) has joined them. Three girls in a 10x10 room is a tight squeeze! Really, only a good picture can do this justice - come back next Wed and I will have pictures and share how we fit all the toys on one small floor of our house. We decided that the best long-term benefit for our whole family would be served by having a massive family room and fewer bedrooms. After all, Braeden (11) is practically a teenager, and right behind his teen years will be - count 'em - t-h-r-e-e teenage girls! A large space for hanging out is pretty much a necessity. I didn't want to be the bearer of bad news for Abbey, though. So I came up with a clever (at least I think so) solution! Abbey will get the girls' bedroom upstairs and Shea & Meg will share downstairs...for one year. We'll move everyone a couple weeks before the start of the school year. Next year, Megan will get her own room. Then Shea. Ta-da! If you're thinking about all the moving around and getting a headache, let me assure you that the girls will NOT be taking their furniture with them when they move rooms. The bunk beds will stay downstairs, whether or not they are bunked or twinned. Dressers will stay put. The only thing that will move is the child and her clothing (which I will put in a laundry hamper to transport). So, I think that this might work for me! :) Make sure to visit the link and see what works for others in the world wide blogosphere. How do you feel about kids sharing bedrooms? Are you for it, against it, or indifferent? and my knees still turn to jell-o. And he keeps getting better with age. but more than anyone else I know - I respect you. Right now, there are about 500 women in North America frantically getting prepared for the She Speaks Conference. I am one of them. Because of God's great provision, four women from our women's ministry team are able to attend and learn from the experiences and teaching of the Proverbs 31 Ministries team. For many of us, preparations include getting our hair cut and coloured, trying on countless outfits, and the like. I don't know what it is, but us women usually do more to get ready for a date with other women than we do for dates with our men! This is me. Tonight is chalk full of 'primping' appointments. Others are also clicking away on their computers in efforts to complete book proposals or practice talks. For many hopefuls, this is our 'one shot' at getting our ideas and our abilities reviewed (and maybe even accepted). Again, this is me. These last few days are packed with plans to write and re-write, making last-minute revisions and memorizing talks. Virtually all of us are trying to get our homes ready for our absence. Cleaning to be done, meals to be planned (maybe even prepared and frozen), schedules to be written out, notes to be left. Yes, this too, is me. Maybe. If I find time. Otherwise, they are on their own and I expect that McDonald's and Pizza 73 will be getting a lot of business over the next weekend. I believe that, in so many ways, this conference will be life-changing, ministry-reviving, heart-refining, utterly amazing. But without Him, it will merely be a good experience. I've had too many God experiences to be willing to settle for a good experience. And God experiences don't happen by accident, they happen with intentionality - by seeking HIM (and not being focused on things like good hair, meetings with influential people, etc.). Lord, help me to keep my eyes focused on You. Still my excited mind, so that it will pay attention to You. Though my hands are busy with getting pre-pared, may my heart stay attuned to being pre-prayered. Is there something you are getting ready for, working on, or hopeful about that is taking up space in your heart and mind? Are you doing what you really need to be doing to be prepared - are you pre-prayered? 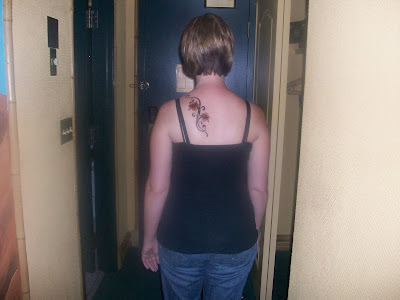 I'm joining in on Blog Hop '09 at Pensieve this weekend. The purpose is to find a few new blogs I love and add them to my reading list (because I have all this free time and nothing to do with it, and I refuse to do housework), to have a few people find my blog and decide they love me, and to try to win some super giveaways! And, what shall I be giving away for the Blog Hop? Hmmmm.... I always give away books, because I love to read. But I recognize that not everyone shares my passion. I know, I'll do up a care package of my favourite things! For example, my fave bubble bath, candle, lotion, book, corkscrew, socks, whatever. As I shop for some of my own faves, I'll just throw an extra in the cart for the lucky winner! I'll draw (via random.org) on Tuesday afternoon (that's July 28th). To enter, just tell me one of your faves. Malakai (almost 2) has been a notoriously slow talker. I don't believe it's an actual speech delay, so much as an issue of "why bother?" After all, he's spent a good year of his life pointing, saying "that" or "doooooosssss" (which means either juice or shoes, depending on where he's pointing) and having six willing people come running to fetch whatever "that" may be. It was about six months ago that we began to realize the boy was not really talking. He had a fairly good repertoire of words that he'd used once or twice each, but if you asked him to repeat it he declined. Literally. I would say, "Kai, can you say 'puppy'?" and he'd respond with a head nod and an "mmm-hmmm." Stinker! As a family we decided to buckle down. No more getting whatever Kai pointed at without encouraging him to name the object. And it has been working! Words, words, everywhere! Malakai, like many little boys, is quite fascinated by cars and trucks. So much so that he will stop walking (even if we're in the middle of crossing the road) to stare at a vehicle. His absolute favourite new word is 'truck.' Thing is, it doesn't sound like truck at all! This past Sunday, I dropped him off in the church nursery and told all who would listen, "Malakai has a new word. I want you to know that he is saying 'truck.' I promise you, he is saying 'truck.' Please make sure you tell all the other workers in here, so no one things he is saying swear words." My instructions were met with gales of laughter. Yesterday, he was running around the front sidewalk admiring all the parked vehicles, "Truck! Truck! Truck!" and pointing. I said (about 400 times), "Yes, a T-RRRRR-UCK." At about time 401, Abbey (7) turns to me and says, giggling, "Mom, it sounds like he's saying f%$@!" with the most innocent little look in her eyes. I bit my cheeks really hard to keep from bursting into laughter, and very calmly replied, "Oh, sweetheart, we shouldn't say that word. It's not nice. Besides, we all know he's saying T-RRRRR-UCK." We were out camping earlier this week (more details on that later). I had good intentions of taking my morning quiet times to seek God, to read my Bible, to pray, to journal, to write for my book proposal. But the reality of camping with five children, two of them still small and needy, altered those plans. My heart was not okay with spending four days and three nights starved for His Word and His voice. I had to find a way to spend time in His Presence that was different from my usual way. As I lay in my bed in the early morning, awakened by the cawing of crows, I asked Him to be with me that day. He whispered, I am with you always. While sitting on a park bench watching the children climb and slide and climb again, I recited His Word (my memory verses) in my head. He whispered, take the bread of life and eat. Standing on the beach, turning slow circles and counting heads 1-2-3-4-5, I begged him to inspire me. He whispered pages of words for me to write to glorify Him. This morning, as I savoured my still quiet, I praised and thanked Him for the way He stays close to me. He whispered, when you call on Me I will answer you; seek Me with all of your heart and you will find Me. What has He been whispering to your heart lately? This routine has become such a part of our lives that I seldom need to tell the children what comes next. I usually just ask them, "what's next?" We have little trouble getting everyone out the door and to their buses on time, and mom and the wee ones aren't running late to do what we need to do!For more handy tips and tidbits, visit We Are THAT Family. The fellowship of other women is one of society's most undervalued blessings. We fool ourselves into believing that we don't need it. I'm too busy to make new friends. We don't have anything in common. She won't like me. I prefer to be alone. Sound familiar? I think we can all agree that women (generally) tend to be more emotional and expressive than men. We have an innate need to "talk things through." Men, on the other hand, want to "fix" things, and as such are not particularly good at listening while we talk it through. Only another woman can truly understand the need to talk about one subject until all possible avenues of discussion have been exhausted. Women are also fairly detail-oriented. We like to be certain that all the pieces of the puzzle will fit together - before we even click those first two pieces together. Men tend to be more global in their thinking (that's my polite way of saying they're vague and/or lazy). You will never find a man who wants to hear how you have planned out your entire day in half-hour time slots. A girlfriend is the only one you can freely share stories of "poo and puke" without fear. The best thing about other women, though, is their wisdom. Women live and they learn. Then they share what they've learned. If one woman has found something that works well for training up her children, or if she's discovered the secret to her hubby's happiness, or she knows where to find toilet paper for really, really cheap - she will tell other women! It is through that exchange of wisdom that mentoring is born. It's not mentoring in the traditional sense, but a reciprocal relationship of teaching and gleaning, leaning and lifting, breaking down and building up. There is no relationship quite like the one formed on the foundation of fellowship - just being together. Is it really even possible to be too busy to make new friends?! All you have to be is you. All you have to do is what comes naturally. The simplicity of just being removes any complexity. There have been times in my life when I've found myself confused (surprise, surprise). We're supposed to love and serve God first, then our husbands, then our children, and so on... But what happens when those things conflict? Then what do we do? Who do we follow? Here's a practical example for you. 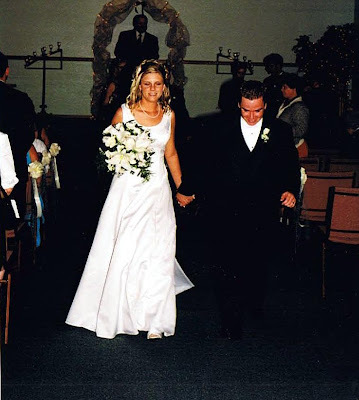 Early in our marriage, I was attending Church and (tepidly) following the Lord. Pat wasn't there yet - he wasn't sure about all that 'religious' stuff. I sat in on a powerful sermon about tithing, and felt called to obedience by it. But the money in our account wasn't put there by me, and we had always agreed that expenses over a certain amount needed to be unanimous. To say that Pat wasn't particularly excited about my idea of giving a significant portion of his earnings to a Church he seldom attended is an understatement. So what was a girl to do? For weeks I obsessed over this - obey God's Word and defy my husband? Honour my husband and disobey God? I did eventually work this out...I found other ways to tithe (of my time and talents) and waited for God to work out the money thing...which he has. Every now and then, someone asks me about a similar situation. I can look up some handy scripture references for them (Ephesians 5:22-24, I Peter 3:1-5), but it can be so difficult to explain in a way that makes sense! So, for anyone who's ever asked that question - married or not, in a Christian marriage, unequally yoked - anyone who's ever wondered how to make sense of the confusion, here is a fantastic analogy that illustrates what God is calling us to (as Christian women, wives, mothers). Imagine a team of dogs pulling a sled over the snowy plains of Alaska. All of a sudden the Master says, “Turn right.” But the lead dog turns left and the others follow. So the Master stops the team, walks around to the lead dog, shakes his little face and says, “I told you to turn right.” Then he gets back in and off they go. Again, the Master says. “Turn right.” But again the lead dog turns left. Well this time the dog behind him turns right like the Master said but in the process creates chaos. So the Master stops the sled, walks around to the lead dog, shakes his face and says, “I told you to turn right.” Then he walks to the next dog that obeyed his command to turn right shakes her little face and says, “I told you to follow the lead dog.” Get it? Your husband is the Lead Dog. Your job is to follow the Lead Dog because that is what the Master really wants. * This story was borrowed from Jenny's personal (private) blog. But you can find other great thoughts of her here. ** This is a re-post from last summer. This morning, Malakai came to show me something in his hand. It was a pink Smartie. For the record, I cannot recall the last time we had Smarties in the house. Also for the record, I do vacuum at least once or twice per week. No idea where he found it. I put out my hand and said, "That's yucky and dirty. Give it to mom." I told him that if he gave it to me I would find him another treat (a neon sign flashed "liar, liar" above my head). "NO!" Have I mentioned that he's an assertive little man? He then proceeded to pop the six-month old Smartie into his mouth and make sucking slurping noises. He smiled his candy smile, patted his tummy with his chubby little hand, and sighed, "Mmmmm, mmmmm." You may have noticed my weight loss ticker. It was up around 7 lbs lost. And it's not anymore. For a couple weeks I just stopped weighing in, knowing that I was gaining. If I weighed in I would have to change my ticker, then I would be ashamed in front of my friends. But I'm not going to keep secrets, and I will refuse the shame the enemy wants to heap on me. Because keeping our struggles a secret only keeps us feeling miserable; when we are open with our struggles, we are opening ourselves up to receive encouragement and prayers. My struggle with this weight loss comes down to two issues: laziness and laziness. I would rather read some good blogs - when I get an hour of quiet time in the afternoon - than exercise. I would rather munch on what's readily available and prep-free - chips, fast food, etc. - than take the time to prepare healthy, lower fat meals and snacks. My nature is to be lazy. So I give in to it. When the guilt comes (and it almost always does), I make excuses. There's too much going on right now and I can only focus on one major thing at a time; I'll focus on the weight loss after this is done. I've already completely shot today (or this week), so I may as well indulge and enjoy. Tomorrow (or Monday, or the 1st) is a good day to start. And round and round I go. I am tired of going round and round. 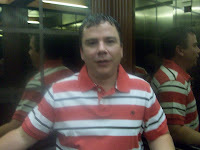 I am tired of my weight going down then back up again. But I am also so tired of fighting the daily battle against my laziness. It's hard to keep going when you find yourself only winning the battle 1/3 of the time. So if you are in the same boat as me, I really want to hear from you. I need a partner in this battle, someone to work together. If you're local, even better (because I could sure use a buddy to exercise with). Isn't everything just a little bit easier when you're doing it with a friend? And what's that all over them? Oh yes - it is PRIMER! 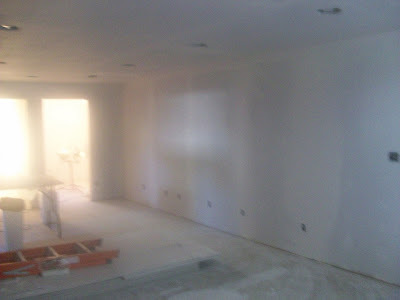 We worked until the wee hours (like 1am) and used six whole gallons of primer. I woke up this morning and promptly took two ibuprofen. I put them in my purse to share with my slave-driver mother (thanks mom!). It's getting so close! 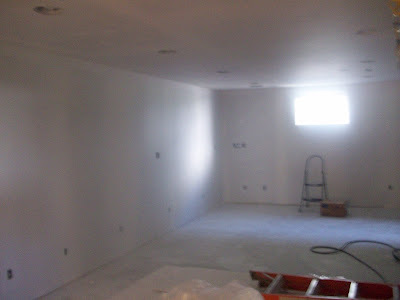 There are some touch-ups to be done with the mud (today), ceilings to be painted two coats (Thurs), walls to be painted two coats (Fri and Sat), flooring to be installed (next week Mon-Wed), and then a whole lot of finishing to be done (doors, baseboards, trim, light fixtures). Okay, now it doesn't feel quite so close. But once the carpets are in, the TV and a box of toys will be placed in the family room - pronto! It may not be ready for moving back in, but I tell ya I sure am ready for some of these kids to move on out of my bedroom (the only TV in the house right now, and did I mention the weather has been crappy?)! 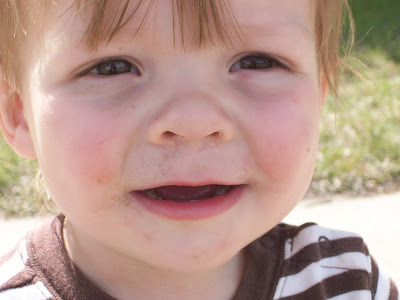 A sweet little baby boy, D, born at term and healthy (07/07/09). Currently hospitalized and undergoing dialysis, with a ventilator doing his breathing for him, his blood pressure being crazy, and his ammonia levels off the charts. Sweet baby, baby number 6 for his momma, strawberry blond hair, unresponsive. Your prayers for his healing - a treasure. Hubby away for the 2nd full week in a row. First week with five kidlets and I cooped up hiding from the rain. Kids getting at each other all day long, me trying desperately to maintain a calm composure. Feeling broken for baby and mom, overwhelmed by the tasks at hand, trapped within these four walls, lonely. Knowing that the only safe place to be in in His presence. Tightly wrapped, closely held, warmly embraced. Pouring each of these concerns as perfume at His feet. Hiding myself in prayer. For if I am out in this world without its covering, I will surely be battered by the weather. On my blog, I try not to tackle too many "controversial issues." I want this to be a place of encouragement for other women (not a place for controversy or debate), and my hope is to draw more readers (not scare them away with overbearing opinions). But there is something happening in Christian circles that I cannot remain silent about. Have you watched any television lately? Any movies? I am disturbed by how using the Lord's Name in vain has become normalized. Movies with a "G" rating (for example, "Hotel for Dogs") have children speaking God's Holy Name in vain! Programming on the Family channel - it's called Family channel, people - same thing. I will give credit to Disney, as I have NEVER heard the Lord's name used in vain on any of their shows (ie., Hannah Montana, Cory in the House) nor their movies. Honestly, it is getting frustrating! You think you can take your kids to a movie rated "G" and expect that there will be little in that movie that would not be appropriate for the children's eyes and ears... I am learning to check out each movie and show we are considering viewing on pluggedin before we view (but sometimes I still forget and am disappointed). I try to use these disappointing experiences as an opportunity to teach my kids about the holiness of God's name, so that they grasp the importance of not doing as they do in the movies. Though it makes my heart heavy, this misuse of God's name doesn't surprise me. After all, we know that the world is a sinful place and the things of this world are not the things of God. What I find completely shocking, though, is when I hear our Father's name used in this manner by Christian people! Hearing those who love God speak his name with anything but reverence knocks the wind out of my chest and crushes my spirit. I can only imagine what it does to the heart of God. Recently, I have heard our Abba's name used as an exclamation point (as in, "Oh my goodness!") by Christian leaders - in large public forums. Just yesterday, by a Christian woman teaching a seminar to other Christian women. A few months back, from the pulpit of a large, well-known church. To say that I was shocked is a gross understatement! I wonder if this makes God weep...or rage? So many people in my life casually use His name as an exclamation point, or even as a swear word, and it pierces me (I can’t imagine how deeply it pierces Him). For many of them, there is no understanding of what they are doing because they don’t Him, and my saying something would likely only turn them off of the Jesus I love. But to hear others who love Jesus use His name – the most majestic name in all the earth (Psalm 8:9) - as an expletive…I feel completely weighed down with the burden of reminding them of Whom they serve. So here is a question for you: What do you say or do (what should I say or do) when hearing people use the Lord's name in vain? Should our response vary depending on whether that person is a believer or not? And a challenge for you (and me): Take one day's quiet time and dedicate it to digging through the Bible and finding references to God's name - how it should or shouldn't be used, the holiness of it, how He wants it glorified, etc. And if you love Jesus, but find yourself unthinkingly using any variation of His name with anything other than awe and reverence, I would ask you why? Man. It sure is hard to get something written on this blog in the morning when all the kids (and their mom) sleep in until 8:00. It's a tough life, I know. We recently added a fence in the middle of the yard to keep Daisy out of the garden. Well, in all honesty, my dad added the fence to keep Daisy out of my mom's garden. 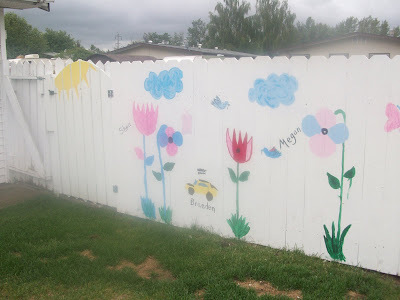 The kids all helped paint the fence. But white is a very boring colour to paint. 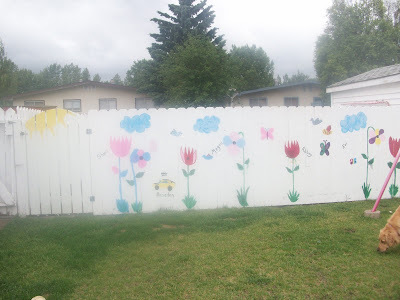 They wanted to paint a mural of flowers, grass, and sunshine. 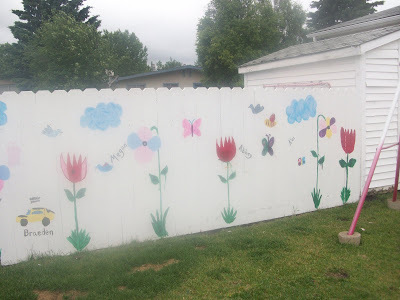 Though I wasn't opposed to the idea, I didn't have the proper paint (nor the time to help and supervise such a project). We all know that Grandmas are much more fun than Moms, so she found the paints and the time. Yesterday was very rainy. The past several days have been around here. Though I'm sure all the farmers are appreciative, those of us with kids off school for summer break are less so. Especially those of us with 5 kids living in two bedrooms due to ongoing home renovations (ahem). The way our morning began, I knew that it was NOT going to be a good, happy, flowers, sunshine, and lovey-dovey sort of day. From about 6:30am (and what are they doing getting up so early on holidays, anyway?) the bickering began. Fighting over toys, over whose turn it was to choose the TV show, over who was breathing too loudly (seriously!)... The littlest one was boldly expressing his almost-2 nature for the whole neighbourhood to hear. And they asked for more food every-five-minutes! I was so close to my wits' end that I couldn't even see it! So I called up a girlfriend and invited myself (and my 5 kids) over for coffee and a visit (for us) and lunch and playtime (for all the kids). As it turns out, her wits had ended earlier that morning, too! We had a good four hours of fun before the kids got tired and started scrapping - this time over dress-up clothes. So I pulled out the big guns and offered a "reward" (aka bribe) to the one who worked the hardest at cleaning up. Everyone ran around like crazy tossing toys in bins, her house didn't look too much worse for having 7 kids climb all over it, and kids were ready for home. We stopped at the store and grabbed some popsicles (the reward) and were home just in time for the rain to break and the sunshine to peek out for about an hour. Two tips for the price of one today ;). #1 - Sometimes when your kids are making you nutty it's best to just pack 'em up and head off for a quick change of pace. #2 - Bribery works, use sparingly. 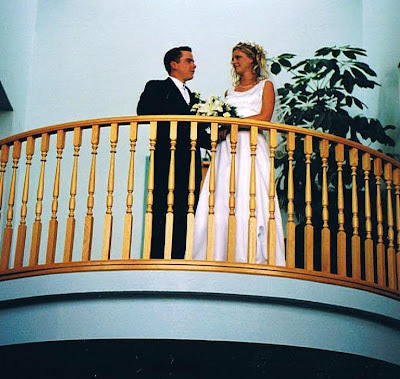 As young newlyweds, we didn't have a lot of money saved up for a fancy, exotic honeymoon. Instead, we chose to stay closer to home and visit the legendary West Edmonton Mall. To commemorate ten years (which, in this day and age is an accomplishment we are pretty darn proud of), we returned to our honeymoon destination. We arrived at the Fantasyland Hotel Friday afternoon. 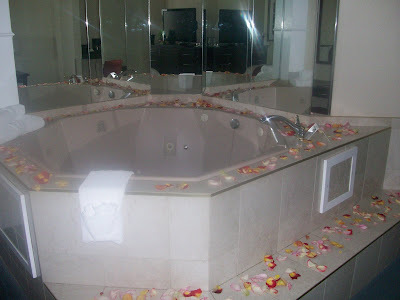 Pat had arranged for the 'romance package' which included rose petals, champagne, a candle, massage oil, and bubble bath. Late Saturday afternoon, I had a special appointment. I'll let the pictures speak for themselves. 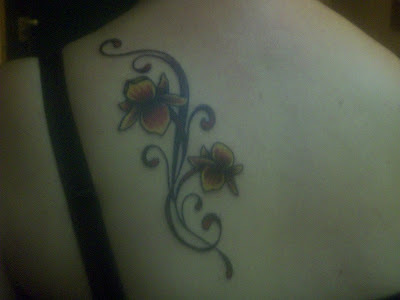 In answer to your question - yes, it hurt a LOT! But I totally love it. Love it! 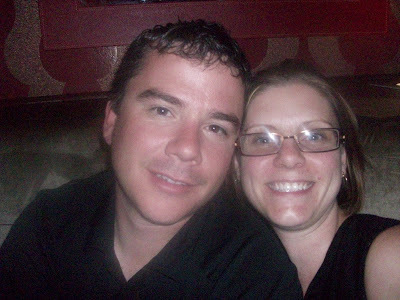 Then we headed out for a late show - Star Wars (Pat got to choose since we spent the whole day doing stuff for me). At the theatre, there are some amazing robotics hanging from the ceiling. 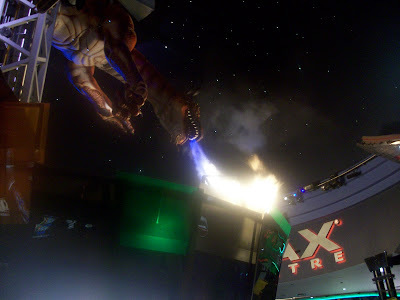 The dragon really breathes fire! 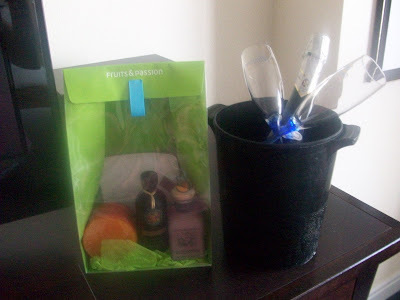 Because it was our special weekend, we received a complimentary upgrade to a theme room on our second night. 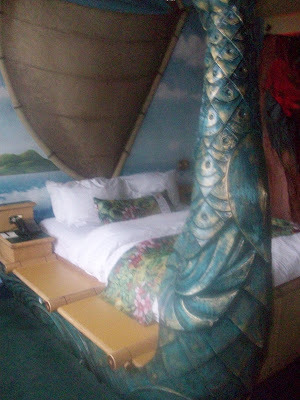 We chose the Polynesian room. 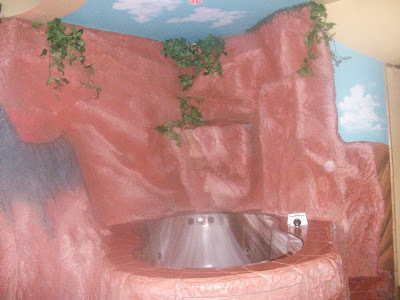 It had a volcano jet tub (which we didn't get to try out due to my fresh tattoo), and a sailboat bed. I think that my favourite part of the weekend was sleeping in until 9:30am for two mornings in a row! Over the course of those ten years, we've had a little bit of each - good, bad, rich-er, poor, health, and sickness. Every single one of those joys and struggles makes this moment all the sweeter. It may be cheesy (that's just the kind of girl I am), but I really do love him more now than ever. After a man has faithfully stuck by his girl's side and cherished her, even through the junk, she can't help but look at him and see a hero. I can't imagine doing life without Pat by my side, making me laugh and making me a little crazy. I thank God for giving me a man who is strong, brave, faithful, loving, patient, fun and funny, and who showers me with love. Not only do I love him, but I respect him for who he is. Look at us - giggling as if we're making our getaway! Which is exactly what we'll be doing this weekend. My sweet man has planned a weekend away at the same place we honeymooned, right down to the childcare. I am just wild about this guy! ...this is what my kids look like every day.